The areas that could lose out if a new north-to-south rail link is built have been revealed for the first time. HS2 would make more than 50 places across the UK worse off - such as Aberdeen, Bristol and Cardiff - research by KPMG suggested. The government said HS2's £17bn cost is part of a £73bn package of transport improvements in the next parliament. It claimed the measures would benefit areas which HS2 will not serve, long before the high-speed line opens. KPMG's findings were only released in a freedom of informatio request passed to BBC Two's Newsnight programme. HS2 Ltd's chief executive has called them "unsurprising". The KPMG report, which was hailed by the government when it was published in September, said the line could boost the UK economy by £15bn a year. It listed the regions it said would benefit, with Greater London (£2.8bn) and West Midlands (£1.5bn) the biggest winners. But the 92-page document omitted data for those parts of the UK not on the proposed line which stand to be net losers from the project. James Bream, policy director of Aberdeen's Chamber of Commerce, said it was "really disappointing" that such a huge number was left out of the original report. He added the negative impact for the whole north-east of Scotland could be "significant to say the least." Dundee and Angus could lose as much as 2% of its annual GDP, KPMG found. Kettering, Suffolk West and Cambridgeshire East are all listed as zones that could see a 1% drop in GDP. 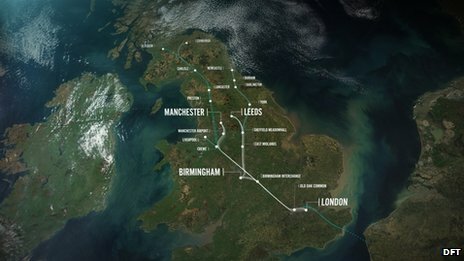 The accountants used data from HS2 Ltd's assessment of the direct transport impacts of the scheme, which would connect London to Birmingham and to Manchester and Leeds. But the Department for Transport said HS2 was vital to "rebalance the economy". A spokesman said: "These figures show it boosts the north overall more than the south. "Of course the line does not serve every city and region and these figures reflect that." The DfT say ultimately the line would reduce journey times to Edinburgh and Glasgow by an hour. Professor Henry Overman from the London School of Economics - formerly an expert adviser to HS2 Ltd - told the BBC it was obvious that, as some cities, towns and regions reap the benefits of being better connected, other places away from the line will pay a price. "When a firm is thinking of where to locate, it thinks about the relative productivity of different places, and the relative wages etc," he said. 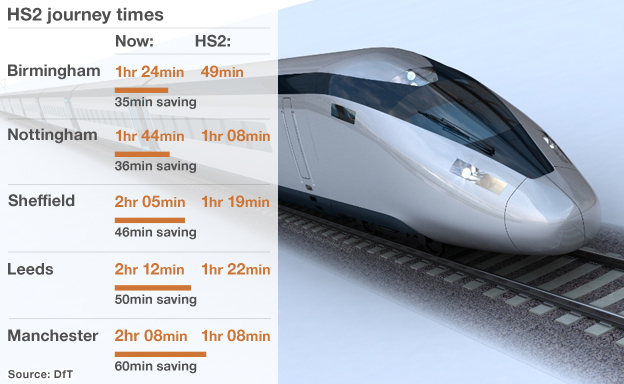 "HS2 shifts that around. So if you are on the line that makes you a better place that hasn't had that productivity improvement." But Newsnight's political correspondent David Grossman said there were "questions about the robustness" of the data. And Prof Overman added both the supposed economic benefits and negative impacts should be discounted by a factor of somewhere between four and six. The chief executive of HS2 Ltd, Alison Munro, said: "What this is showing is that the places that are on the high-speed network... those are the places that will benefit most from high-speed two. "But high-speed two isn't the only investment that the government is making. Over the next five years it is planning to spend £73bn on transport infrastructure."